I was part of a maori hangi ceremony once. Unique and spiritual, it was an experience of a lifetime. My husband Baroon and I shared a home with Ian and Penny for the first year that we lived in Christchurch. The ceremony was held in our backyard to celebrate their recent wedding. Only close friends and family were invited. We had the good fortune of being both to them at the time. 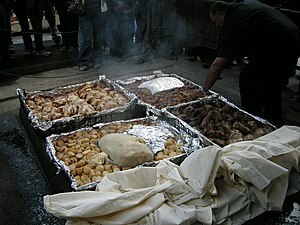 ‘Hangi is how Maori used to cook their every-day meals in the old-times. Now, they are mostly just a way of marking special occasions.’ explained Ian as we ate dinner, a week before the ceremony. ‘Not very often too, because of the work that goes in.’ added Penny. ‘I’ve never been to one in my whole life.’ I found this strange to start with. Penny was kiwi, she’d lived in New Zealand all her life. Ian wasn’t. He was part Indian. The importance of what we were going to be a part of began to dawn upon me from this point onwards. The day started early. At 7:00am, Penny and I sipped coffee in the kitchen and organized the food in the order that it would go in. ‘The pork goes at the bottom, topped by chicken and then lined by potato and kumara (kiwi word for sweet potato). Everything has to be carefully arranged for it to cook evenly.’ she explained. In the backyard, Baroon, Ian and four of his friends worked out where the pit would be dug up. The last two days had been spent in getting everything together- coal, old railway ties, hessian sacks, metal baskets and digging equipment. Penny’s mum, Sharon and her sister were the first ones to arrive. The house was full by 10:30am. Everyone was trying to help. The party had well and truly begun. I knew by now that hangi, meant earth oven and was a kind of slow-cooking method where food was cooked by being buried in a self-made pit oven. 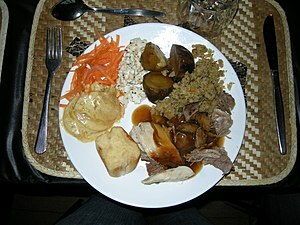 It could sometimes take up to five hours before the food is ready to be taken out. In the old days this method of cooking was part of everyday maori life. Today, hosting a hangi ceremony was a way to connect with ones culture for third or fourth generation maori’s. I stood on the porch and watched as a fire was lit in the newly dug out pit. As soon as the flames subsided, the railway ties were placed at the bottom. A layer of wood and coals covered the ties and another fire was lit on top. ‘It’s the steam from the iron ties that eventually cooks the food. All extra burnt out coal and wood will be shoveled out once the ties are hot enough,’ Sharon said leaning over. ‘Baroon is lucky to have been one of the guys that Ian chose to help put in the hangi. They must be very close,’ she added. She was right. This gesture on Ian’s part had re-enforced their friendship. At this point, I decided to take a closer look. Before I knew it, I walking in the other direction. Ian was holding my upper arm and walking beside me. Baffled, I looked at him and stopped. ‘Women are not supposed to go close to a hangi pit.’ he frowned. ‘Caught you just in time, before one of the elders told you off.’ He turned away. I stood there, staring at his back. Startled beyond my wits, it took me a few minutes to recover. Last basket in, the pit was filled up with earth. Extra rail ties were placed on top to keep the steam from getting lost. Drenched in sweat and beer in hand, Baroon sat next to me on the stairs. ‘I’ll never forget that.’ he said. I smiled. Four hours later, the men were back at work. 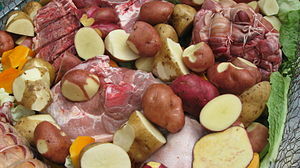 Top layer removed, the food baskets were pulled out. One of the older guys came forward to inspect the food. ‘Sweet as!’ he said in true kiwi lingo giving a thumbs up. ‘Come on guys, let’s lay the hangi!’ yelled Ian as everyone around clapped and whistled. Presiding over the food and the ceremony, Penny’s grandfather read out a Maori prayer in the midst of complete silence. Looking back, I should have asked someone to translate it for me.I didn’t at the time. I suppose, at the time it was enough that I understood what it stood for. Prosperity and well-being. The food took over from there on. The meal tasted great. The meat was tender and falling off the bone. The flavor was strong and smokey. Quite unlike anything I had ever tasted. Juices from one ingredient and flowed into the other, creating a whole new mix. We ate for nearly three hours. The hangi finally came to an end around late evening. Leaning on the railing of the porch, I stared into the empty backyard. A few hours since everyone left, Baroon and Ian too had gone to bed. As for me, standing there it was almost as if I was trying to prolong the experience. Just for my consumption. This was the closest I would probably ever get to old Maori culture. I realized I was lucky to be there in the first place. It had left me fascinated and intrigued. ‘What are you looking at?’ It was Penny. I shrugged my shoulders in reply. ‘Thank you for being here today.’ She was standing beside me now. I should have been the one thanking Penny. The irony of it seemed to be lost on her. Finally I did. ‘This means a lot, Penny.’ We hugged.